This is an evergreen coniferous species of tree that is found from southern BC south to California, New Mexico, Texas, Nebraska and South Dakota. Tree to 40-50 m tall; bark thick, deeply furrowed, dark reddish-brown or blackish when young, changing to cinnamon red when older and exfoliating as irregular scales. Needles mostly in threes, often twos, occasionally fours or fives, (10) 12-20 (25) cm long, clustered towards branch ends; yellowish-green. Seed cones near branch tips, deep reddish-purple when young, maturing late in second year, turning brown; egg-shaped, 8-14 cm long; scales brown with thickened, yellowish, prickly tip; pollen cones yellow to purplish, strongly clustered. 1. Needles 2 or 3 in a bundle. 2. Needles generally in bundles of 2, 2-6 cm long. 1. Needles usually 5 in a bundle. 4. Cones sessile or subsessile, 5-25 cm long, cone scales thick, woody, and sometimes remaining closed, seeds wingless or wings short and remaining attached to scale. Mesic to dry slopes, river terraces and flats in the steppe and montane zones; common in SC and SE BC; S to CA, NM, TX, NE, and SD. A very shade-intolerant, montane, North American evergreen conifer distributed in the Pacific, Cordilleran, and Central regions (rare in the coastal region of British Columbia). Occurs in cool temperate and cool semiarid climates on very dry to moderately dry, nitrogen-medium soils; its occurrence decreases with increasing latitude, elevation, and precipitation. Grows in pure or mixed-species stands (usually with Douglas-fir) on calcium­rich, water-shedding sites in the southern coast-interior ecotone. Most productive on fresh and nutrient-rich soils within cool temperate climates. Characteristic of dry continental forests. 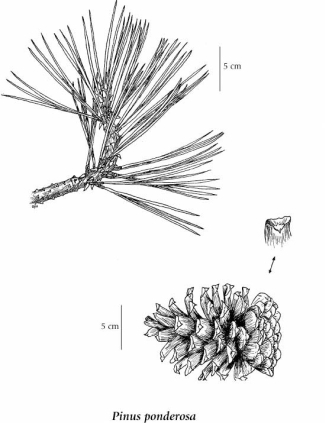 Pinus ponderosa subsp. jeffreyi (Balf.) Engelm.